There is water on the Moon—lots of it. Permanently-shadowed craters at both poles have been trapping and accumulating ice for billions of years, research has shown. These cold traps contain at least 600 million tons of ice according to research done over the last few years. Concentrated stores of ice on the Moon could revolutionize space travel. Lunar ice could be mined and split into its component elements hydrogen and oxygen to make rocket fuel, then brought to low Earth orbit and sold. An orbiting filling station could spur a wave of space travel because spaceships wouldn’t have to bring all the fuel they need from Earth. Considering that it costs about $10,000 to put one kilogram of payload into low earth orbit, there is a huge incentive to set up a mining camp on the Moon to tap these vast deposits of water to create a sustainable expansion into space. The lunar poles are unique because they have craters that never get a drop of sunlight, making them super cold. Shackleton crater, named after the famous Antarctic explorer Ernest Shackleton, is one that has been studied in detail. 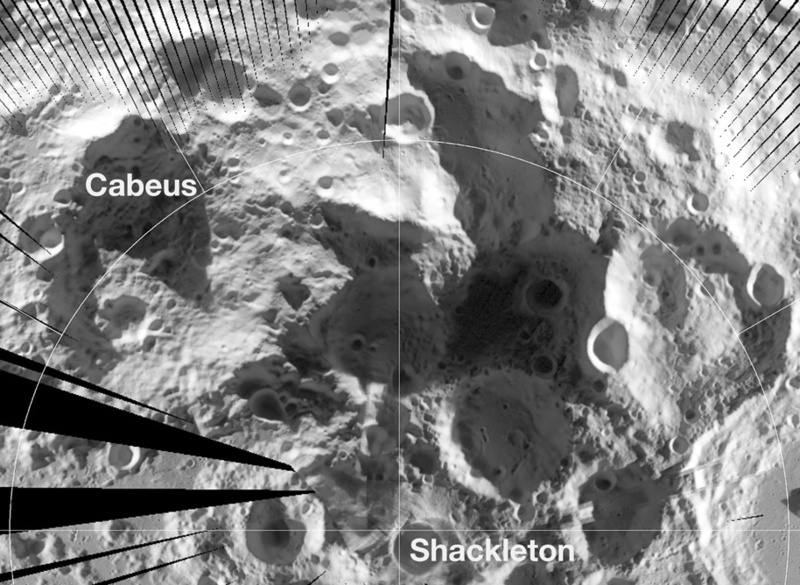 Situated at the Moon’s south pole, the interior of Shackleton crater is in permanent shadow. Also, the rim of this crater is in constant sunlight, making it an ideal location as a lunar outpost. Sunlight on the rim could provide energy for solar panels which in turn could provide the energy needed to harvest the water in the crater, and NASA is planning on setting up an outpost there by 2020. NASA’s Lunar Reconnaissance Orbiter (LRO) probed this impact crater with radar back in 2009. Shackleton crater was a good candidate because it is so massive—4.2 km deep and 21 km across, making it one of the deepest crater on the Moon. By analyzing the reflections off Shackleton crater, researchers discovered that is contains radar-transparent material which is consistent with ice. Several other Moon missions have corroborated the existence of water on the Moon. In 2008, India’s Chandrayaan-1 spacecraft found evidence of water molecules on the lunar surface by deploying an impact probe onto the surface of the moon and then flying through the cloud of debris it kicked up. Chandrayaan-1 also mapped the moon with radar from 2008 to 2009 and found that the polar regions contained ice within the depths of permanently-shadowed craters. In 2009, the Lunar Crater Observation and Sensing Satellite (LCROSS) also discovered water and ice kicked up after an impact probe smashed into the Cabeus crater near the Moon’s south pole.